The Brazilian airline's shares will be listed both in its home country and on the NYSE. 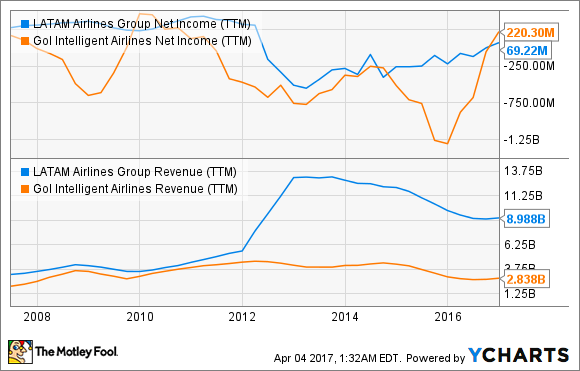 On the back of comparatively low fuel prices, among other factors, airline stocks have been popular lately. There's going to be a new one soon -- Brazil's top discount airline Azul will launch its initial public offering later this week, with its shares coming to market both in that country and in the U.S. Here's a brief, flyover view of the company and its upcoming issue. Azul is a relative youngster; it was established in 2008 by Brazilian native David Neeleman, also the founder of JetBlue Airways. Neeleman still serves as Azul's CEO, and owns 67% of its common shares; following the IPO, he will retain a controlling stake. According to Azul, these days it is the No. 1 airline in Brazil in both departures and cities served. At the end of last year, the company had 123 aircraft in operation, and its passenger load factor (the average occupancy of its planes) was just under 80%. That falls between its two major competitors on the domestic market, Gol Linhas Aereas Inteligentes S.A. (NYSE:GOL) and LATAM Airlines Group S.A. (NYSE:LFL) -- the former's latest result was 77.6%, while the latter's came in at 84.5%. Azul says that it currently has 784 daily departures, and serves 102 destinations, 96 of which are located in its home country. It's happy to point out that this latter tally well exceeds the counts for both Gol and LATAM, with 52 and 44 domestic destinations respectively. Azul also hastened to say that the domestic airline industry has grown quickly. It cites data indicating that the number of domestic passengers rose by over 90% from 2008 to 2015, to total around 96 million. That tally is expected to climb to roughly 131 million by 2021. Over the past few years, the company's revenue has climbed encouragingly from 5.80 billion reals ($1.86 billion) in 2014, to 6.26 billion reals ($2.01 billion) the following year, to 6.67 billion reals ($2.14 billion) in 2016. Across that span of time, the global airline industry benefited from a drastic reduction in fuel costs -- typically an airline's second-highest cost item next to salaries. In spite of that, Azul's expenses took a big bite out of results. The company posted net losses of 87 million reals ($28 million) in 2014 and 1.08 billion reals ($346 million) in 2015, flipping to only a slim net profit of under 18 million reals ($5.8 million) last year. Brazil is a massive country that can be challenging to traverse; in that respect, it's a ripe market for air travel. But it needs an improved economy. Azul isn't the only member of its peer group that has suffered revenue erosion and bottom-line losses; Gol and LATAM experienced the same dynamic during Brazil's economic struggles earlier this decade. LFL Net Income (TTM) data by YCharts. So a play on Azul's stock is effectively a play on the nation's economy. Some prognosticators believe Brazil's downward trajectory will soon reverse course: Both the World Bank and the International Monetary Fund have forecast modest growth over the next few years. That could provide the lift to push the ambitious Azul into solid, maybe even sustainable, profitability. Seventy-two million preferred shares of Azul will be sold in the IPO. Of these, 24 million will take the form of American depositary shares and list on the New York Stock Exchange under the ticker symbol AZUL. The ADSes should sell for $18.02 to $21.81 apiece in the IPO. The stock's first day of trading is slated for Friday. In its prospectus, Azul says that it will use slightly more than one-quarter of the estimated 1.26 billion reals ($404 million) in gross proceeds from both listings in order to pay down debt. The remainder is to be utilized for "general corporate purposes." The company did not get more specific. The lead global coordinators of the issue are Citigroup, Itau Unibanco's Itau BBA, and Deutsche Bank Securities.